Options: StarSan 4 oz. StarSan 8 oz. StarSan 16 oz. 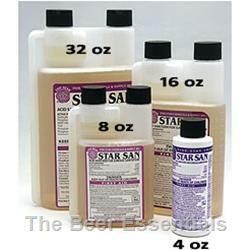 StarSan 32 oz. An effective, high foaming no-rinse sanitizing solution. It will not corrode stainless steel or kegs. Do allow for this product to air dry on your equipment to reduce foaming.